DP World already installed equipment for measuring the actual weight of containers at Jebel Ali Terminal in accordance with the new rules of the IMO, which come into force since July 1. The weighting bridge will help shippers in measuring the actual weight of containers and will issue VGM certificates, which will be need for shipping the product. DP World released that tax for the certificate to the customers will be 18 USD per container. The port operator continue with the plan for installation of weighting bridge at all its container terminals until entry into force of the IMO requirement on July 1. The container weight verification is IMO requirement, which was adopted by Maritime Safety Committee at its 93rd session in May 2014 and approving changes to the Safety of Life at Sea (SOLAS) convention. It makes mandatory the declaring of container weight before loading on board of container ship. The responsibility for obtaining and documenting the verified gross mass of a packed container lies with the shipper. A container packed with packages and cargo items should not be loaded onto a ship to which the SOLAS regulations apply unless the master or his representative and the terminal representative have obtained, in advance of vessel loading, the verified actual gross mass of the container. If the shipper does not declare the correct container weight, then a third party, for example the terminal, shall weigh the container and charge the shipper. Many shippers and port operator opposed the new requirement, due to short time for implementation and installation of weighting bridge equipment. 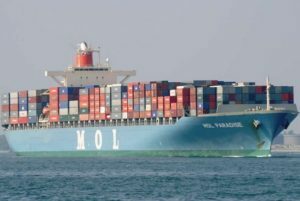 However, IMO stays strong behind new rule, which should help with better determination of stability faction on board of container ships, as well as improve safety during cargo handling operations. Stefani Igaz is 26 years old writer and editor from Brussels, Belgium. She is writing about maritime business, shipbuilding and offshore for Europe and Asia regions.